FYI, the talented producer of this picture informed me that this was done with Microsoft Paint, not Photoshop. Never mind my previous comment about Microsoft Paint. It turns out this one was done with Photoshop, but there was another image that was done in Paint (but still looks really good). i have nightmares about robojoe beating me with hagendaaz bars. Thank you Brother T! 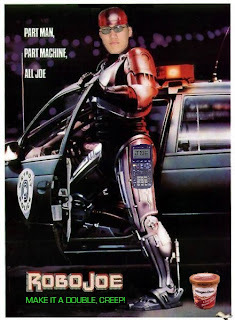 This is my favorite picture for Joebo-Cop! This is Wayyyyyy to cooool~~~! This is why I no longer teach photoshop MYT. That's awesome... what is that other image that was done in Paint? Is it as good as this one? Brother T, please come back and teach Microsoft Paint MYT to those of us who don't have the money to buy Photoshop. wait, this isn't a real photo? What happened to: "With great power, comes great responsibility?" I did not teach my students that. This is MS Paint. Jasper, you've got to submit your Terminator picture of JohnCai...! Thanks for bringing that up, Joyce. I hope that the brother T who made this Photochop is not someone who took the formal oath from that great icon of American ethics, the movie "Spiderman" ("With great power comes great responsibility") in an MYT class. Since it was M$ Paint, probably not. However, interesting idea to have MS Paint MYT! Perhaps we can do a GImP MYT too (Gnu Image Processor - free, but it's a little underpowered).